Jessica and Adam got in touch last year looking for a photographer for their Curradine Barns wedding. Our messages at first consisted of us sending dog photographs as they have a Cavapoo named Ted (awesome name). We Skyped at first for our initial meeting which contained a brief staring role from Ted. We then met in person whilst on my way back from visiting my sister in Wales. We met at Ironbridge Gorge for an engagement shoot. Jess and Adam were just like they were over Skype, fun to talk to, wanting the best day possible and full of love. On an engagement shoot there is only a small time to break the ice before your shooting couples portraits. Easily the most challenging photographs of any of my work as I work hard to make my couple feel at ease whilst taking their photograph. There’s no getting eased into the day like you do at a wedding. It’s just straight in to the “deep end” standing in the middle of the bridge with a lot of people walking past looking at you a little funny. The engagement shoot was a pile of fun and only made me more excited to experience their wedding day. Jessica and her twin sister run a floristry business so the flowers on the wedding day were possibly my most anticipated feature. They did not disappoint! I couldn’t look anywhere without seeing beautiful crafted bouquets, button holes, table arrangements, etc. I knew I wanted these flowers to become a large feature of my work this day and they’re featured in a lot of my work. Originally constructed as a grain store, Curradine Barns has now been converted into an incredible wedding venue in the heart of Worcestershire. It’s red brick finish is very eye catching separating it away from the more abundant dry stone looking barns. The Galloping Gormet team ran by Toni were fantastic and the only aided my photography for the better letting the day unfold in such a beautiful way. 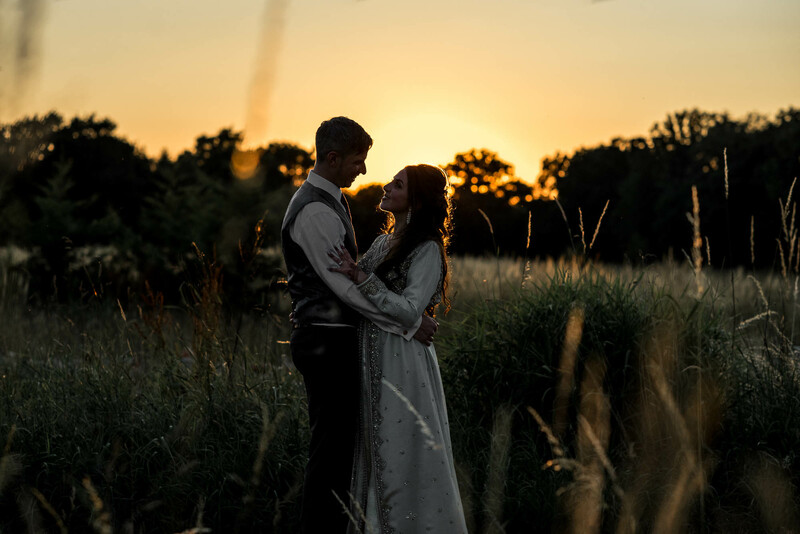 Looking for a Curradine Barns Wedding Photographer? I’m a relaxed and informal Stoke-on-Trent wedding photographer who often ventures further afield including Staffordshire, Derbyshire, Cheshire, Shropshire and the rest of the UK. I don’t charge for my travel or accommodation as I love the look of different landscapes in my photographs. If you are interested in having me photograph your wedding whether it’s in Curradine Barns or elsewhere then CLICK HERE to drop me an email about your day. If you’d like to hear a little bit more about me, my life and my sausage dog you can click here to find my about page.